When looking at the major challenges facing the world, one thing is clear: science can and is changing the world for the better. From addressing climate change to eliminating hunger and malnutrition: science and technology have a key role to play. 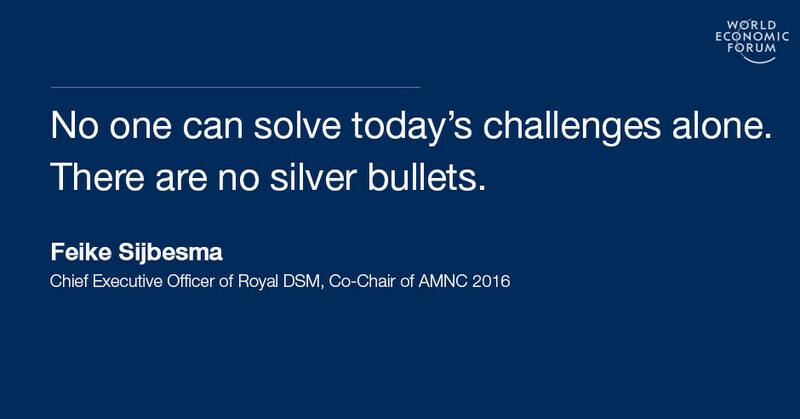 As the CEO of Royal DSM, I am incredibly proud of our more than 2,000 scientists who are working every day to find answers to some of the most important global challenges facing our society. While we all recognize that science can drive change, we also know that the great challenges of our age cannot be solved by short-term actions only; they require long-term commitment, vision and resources. Yet, most likely, the balance of our thinking and action is more focused on the short-term horizon of the (quarterly) earnings cycle rather than being dedicated to the big issues facing humanity in the long term. For many, dealing with long-term, disruptive change is not always easy. Perhaps, this is unsurprising. Throughout our evolution, our minds have evolved to handle immediate problems and threats. When, for example, we see something moving in the bushes in front of us, our first instinct is to consider danger instead of opportunity. While short-term thinking is not surprising, it can be problematic. In his 2004 book A Short History of Progress, Ronald Wright describes human beings in today’s world as running 21st century software on 50,000-year-old hardware. The results can be catastrophic. For example, our inability to properly consider long-term risks or opportunities in combination with our short-term focus explains the four decades of inaction in dealing with climate change. We did not respond to the proverbial hand moving in slow-motion towards our face before it was nearly too late. It's remarkable that, in several European countries in the past few months, climate change concerns suddenly emerged when heavy summer rainfall flooded cellars and parking lots, the sort of thing which will happen increasingly frequently. However, if you look to the south of Bangladesh, the Horn of Africa, the North Pole icecap and other areas, the warning signals have been there for decades. It’s only when a threat comes close that we really see it and realize the potential impact, with the risk that we have left it too late and will face much higher costs to deal with it. We cannot go on like this. The challenges (and opportunities) we need to address are getting more complicated by the day. Everything from self-driving cars, genetic engineering, block chain technology and robotics require integrated, long-term thinking, investment and action across a range of sectors. What then has to be done? How can we overcome the limitations of our 50,000-year-old hardware, and equip ourselves to tackle the challenges of the Fourth Industrial Revolution? First, while we cannot change our hardware, we can try to learn how to use our software differently to better incorporate long-term thinking into our decision-making process. This is vital. Back in their 1989 book New World, New Mind, Paul Ehrlich and Robert Ornstein argued that our ‘new world’ of short-term technological and environmental change requires a 'new mind capable of perceiving long-term, slow-motion calamity’. They argued: if we learn to think probabilistically, we can recognize misjudgment and cognitive bias. Daniel Kahneman argued in his 2011 book Thinking Fast and Slow that humans fail to take into account complexity and that their understanding of the world consists of a small and necessarily un-representative set of observations. Furthermore, the mind generally does not account for the role of chance and therefore falsely assumes that future events will mirror those in the past. Second, in addition to becoming more conscious of our preference for short-termism, we need to be adjusting our systems in ways that compensate for our blind spots. This is crucial: the world is an interconnected system in which many of the challenges we face are anchored in complex ecosystems. No one can solve these challenges alone. There are no silver bullets. That is why, for example, independent advisory boards, bringing in a range of experiences and perspectives are important. Collaboration is also key – which is why our scientists cooperate extensively with external R&D institutions, academic institutions and in broader public-private partnerships. Increasingly we find that a development in one area can have far-reaching consequences in other areas. For example, our POET-DSM joint venture in the US uses expertise developed originally in food enzyme research to create bioethanol from corn crop residue. We are convinced that in the long run, using new biotechnology techniques will help to build better societies and with that, it will become economically viable as well. Finally, we need to change the way we communicate around the big challenges, moving away from a "fear sells" approach and embrace the sort of positive and ambitious messaging that can motivate profound shifts in behavior. Take climate change. In the run-up to COP21, climate change was mostly presented as a threat. But it is also – and even more so – an opportunity: to change our economy, to clean up our environment and to improve our overall quality of living. If climate change had been more clearly and positively communicated, maybe more brains would have been engaged in tackling the issue decades ago. Developing new alternative energy solutions, like solar, could result in a future where energy from the sun is almost free and energy savings will be “so 2016”. The same applies to other long-term developments about to affect our societies such as robotics, self-driving cars and the sharing economy that are currently – just like that something moving in the bushes – presented as threats rather than an opportunities. If we turn our messaging on these subjects on their heads, who knows what we can achieve? In short, with the technologies emerging in the Fourth Industrial Revolution, which Professor Klaus Schwab, the founder of the World Economic Forum expressed so clearly in his book, we have an incredible opportunity to address some of the world’s most pressing challenges. But making the most of the opportunities will require us to look much further than the quarterly earnings cycle and become consistent, long-term supporters of the science and the scientists who have the potential to change the world for the better.